The PANCE and PANRE: some of the most dreaded or most awaited terms for practicing physician assistants and physician assistant students. The task of preparing for this standardized test as a student, or trying to study for the recertification for this examination while being a practicing clinician can be daunting. However, there are tips, tricks, and guides to make this easier for us! One of these includes taking a look at the PANCE blueprint. The PANCE exam breakdown is a great starting point when beginning to set down the path for preparing for your examination. The PANCE blueprint 2019 is created by the NCCPA and gives a comprehensive list of topics to master prior to your PANCE or PANRE. Side note: We published a 40 page article on studying for the PANCE. Click here to check it out. This list breaks down the topics into medical body systems and even tells us what percentage of the examination will be comprised with questions on cardiology versus dermatology versus EENT and so on. The NCCPA PANCE blueprint also breaks down each system in depth and lists all of the specific topics that should be mastered within each system that is covered on the examination. As you look at this all-inclusive list, you may get a pit in your gut type feeling. No worries, we will discuss ways to attack this challenge soon! The PANCE blueprint also breaks down the tested content into categories such as the type of question that is going to be asked. These task categories include history taking and physical examination skills, using diagnostics and laboratory studies, formulating the most likely diagnosis, managing patients including health maintenance, patient education, and preventive measures, clinical interventions, pharmaceutical therapeutics, and applying basic science concepts. Additionally, there is a category subset on professional practice questions which may cover legal and medical ethics, medical informatics, patient care and communication, the physician and physician assistant relationship, professional development, public health, and risk management. Whew! That’s a lot!! The amount of information that is on the NCCPA PANCE blueprint can be quite overwhelming. However, look back at your time in physician assistant school and appreciate and realize what you have been through. The design of your program is for you to complete and pass the PANCE and continue onward to being an astute clinician. During school, you have survived several long-filled nights of studying, practiced physical examination skills on your classmates, friends, and significant others, and several lectures and lab sessions. But most importantly, you have excelled at all of these obstacles. Remember, this is just another examination! As mentioned in our previous article, Surviving PA School , you have to know what works for you personally regarding the best way to study and the best way for you to learn and refresh yourself on the board examination topics. What may work for one person, may not work for another. And that is okay! For me working together closely with my three closest friends and now astute colleagues was the best route for preparation. We created concise documents and review sheets on each and every one of the topics listed on the PANCE examination breakdown. We used PANCE and PANRE review books as well on online resources and the Medgeeks Review Course for concise information including the signs and symptoms, risk factors, diagnostic testings, treatment, and patient education for all of the examination topics. Yes, this takes time to gather and it is hard work, but in the long run, this was working smarter, not harder. 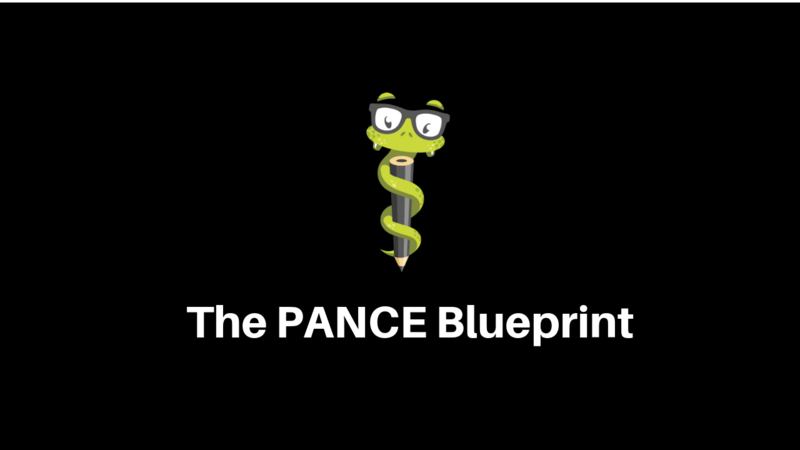 Once our study guide was created based upon the PANCE blueprint including and covering all of the PANCE Task Categories, we had our concise guide and we were set! We would quiz each other creating simulated patient cases to try and create “PANCE like” questions for one another. I found this method also to be a good way to keep each other honest and compliant with our studying habits. As mentioned above, however, this may not be the best way for you to study. You may work better by sitting and reading review books, or by doing question banks solely. Whatever and however you choose to study and prepare for your PANCE/PANRE, assure that you are following the PANCE blueprint 2019, as this is the key to our success, to assure that we do not go astray from the contents of the examination. After you have proverbially “beaten the dead horse” and sifted through your PANCE blueprint, I routinely completed practice questions. These allow you to practice reading questions stems, extrapolating needed information, and training yourself to look for and choose the best answer. It also will allow you to see why the other answers are not correct. Of course, everyone wants to get all of their questions correct, but practice questions that you do not get correct are equally, if not more important. You must go back through and read the explanation to these questions to learn why you got the question incorrect, and to learn the correct logic and reasoning for the correct answer. Lastly, you can set up a mock test environment and time yourself while completing the test questions. You want to assure that prior to the examination that you can sit and complete questions in the timely manner that is necessary so that you do not enter test day and you end up not ever laying an eye on a myriad of test question due to running out of time. Remember as you go into and work towards your test day all that you have been through to get to the point where you are at. The remaining few days prior to your examination, close your books, and relax. You have been through a rigorous two years that have included studying for this examination, plus several additional weeks committed solely to the PANCE blueprint. The final two days should be committed to relaxing, because with further studying, you will continue to run into facts and tidbits that you did not know, which will cause you to question yourself and make you wonder what else you did not know, leading to test anxiety. The world of medicine is constantly evolving and rapidly changing. This never ends, and will never change. I routinely learn new things and things that I didn’t know, and I took the PANCE two and a half years ago. By relaxing the last couple of days, you give your mind a well needed and well-deserved break from sifting through the NCCPA PANCE blueprint and practice questions. Last but not least, believe in yourself. Walk into the test center confident that you are going to crush the examination, then go do it!